High fire, moderately sandy, plastic, semi-vitreous, grey burning lightly speckled, general purpose native material body for reduction fired stoneware. H435 has been manufactured for many years. It has about 15% fine sand and is quite high in silty stoneware clay; these are balanced by our native plastic stonewares and some of our high coal, super-plastic ball clay. H435 is semi-vitreous and has been used by people who want something a little finer than the very coarse H431. However, for functional applications, we recommend the much stronger (fired strength) and smoother H550. H435 contains significant amounts silty clay and sand which give it a lower drying shrinkage and quite sandy texture during throwing. H435 contains a high coal ball clay which imparts a dark grey blackish color to the pugged. This ball clay significantly masks the feel of the sand during the throwing process. The open structure of H435 also means that extra water can be absorbed during throwing making it more susceptible to water-splitting (the sand provides openings into which water can penetrate). Thus it is beneficial to use water sparingly during throwing and make sure that it does not stay long on points where the clay is under stress (i.e. the outside of the belly on a vase). Since H435 generates significant amounts of slip during throwing, try to develop a technique where the slip produced during centering can be employed later as a lubricant during throwing. H435 fires to a variegated speckled stone-grey color at cone 10R. It has more speckle than H550. In oxidation firing there is some very fine specks and the body retains a stoney light grey color through the cone 9-11 range. Although H435 may appear stable at cone 11 sometimes we cannot guarantee successful results in this range. Although it has a low overall thermal expansion H435 is easy to adapt non-crazing glazes to. It contains plenty of high quartz plastic clays. Thus a glaze which crazes on a porcelain body will usually fit well on H435. H435 is quite dense in the bisque state compared to porcelains, thus it does not absorb water as fast or evenly. This may lead to some pinholes after the glaze has dried but these are no cause for concern as they heal during normal firing. We suggest that you do not bisque this body any lower than cone 06 because it does contain some carbonaceous material that needs to be burned away before the glaze firing if possible. 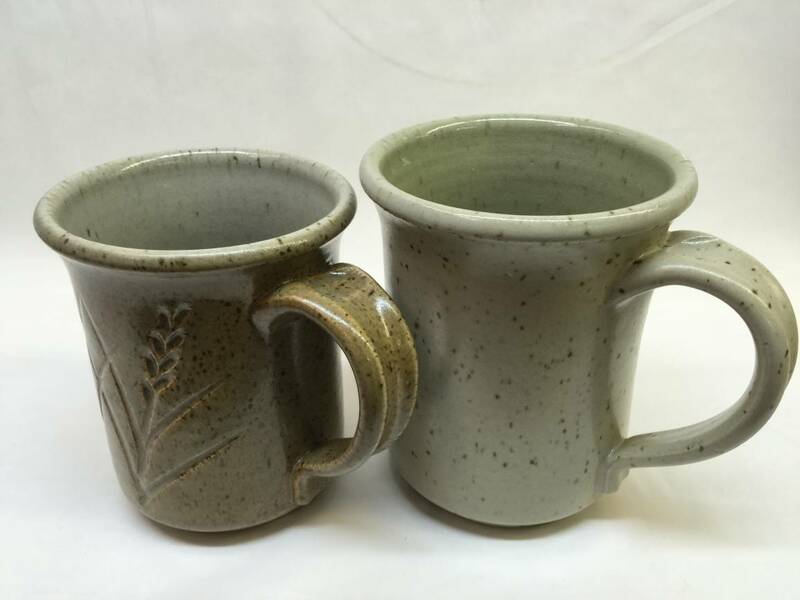 H435 mugs fired at cone 10R.